Please refer to our stock # 01132 when inquiring. A great looking Mexican sterling silver Metales Casados pin c1950s-60s. 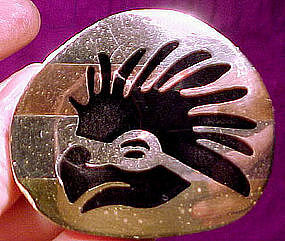 This anamorphic 2-1/4" X 1 3/4" pin has a black resin stylized bird on a silver, copper and brass ground; the silver backing to the black resin is stamped HECHO EN MEXICO 925 and it has a safety catch. It weighs 15.9 grams and it is in excellent original condition with no chips, cracks, dents, bends, corrosion, losses, damage or repairs. All items are thoroughly and conservatively graded and all condition issues are noted; all items are secondhand and may have slight signs of gentle use. Surface shipping to the U.S. starts at $6 (other spots may vary) - insurance is automatically included. Items paid with a credit card will be shipped to confirmed addresses only. We do ship internationally. All of our prices are in $US. PLEASE NOTE: we do not accept Paypal.